Familiarize yourself with spoken French. 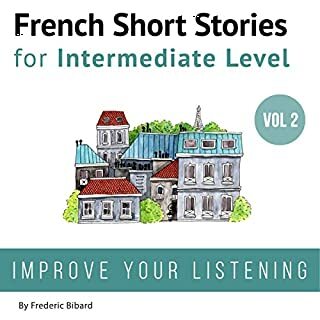 Qu'avez-vous particulièrement aimé dans le livre audio French: Short Stories for Intermediate Level ? This audiobook was understandable, accessible and well structured, which is what i particularly liked. Each story introduces accessible vocabulary which is used very often. It also provides French expressions which improves the listener's notions in the language (e.g: 'cercle réduit' d'Arnaud- story 5). Qu'avez-vous aimé de la performance de Frederic Bibard et Mariem Nouni ? I thought Frederic Bibard and Mariem Nouni were very easy to understand and developed a good approach towards the telling of the stories. The structure of the audiobook was also easily done. However, I wished they had asked questions at the end of each story as to test the listener and make sure he/she understood. I also thought that the idea of having different voices (male + female) and having a vocabulary recap at the end of the stories was appreciated. Yet, I would have preferred to have the first vocabulary recap a bit more slow as I believed one could easily become confused; it was difficult to remember all the different notions all at once (despite the different levels- beginner/ intermediate). The second vocabulary recap was slower, which I thought was much more easy to understand. Globally, I believe their performance was very well done. I thought the stories were childish but in a nice way; all of them had a sweet ending. I have had a positive experience and would recommend it. I highly recommend this book if you are looking for a quick crash course in French. I hadn't spoken French since taking it as a class in high school, so reading this was the perfect way to recall everything I had learned while also teaching me a lot more! One thing that I especially loved was that words that I learned earlier in the book were used frequently later, so I never forgot them and also learned how to use them in new ways and contexts. 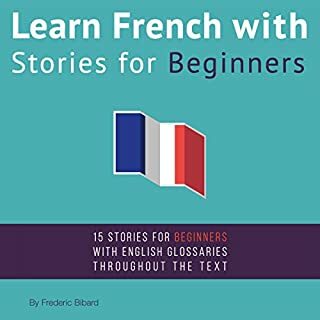 I think that this book is perfect for people getting back into the habit of speaking or learning French, as well as people who are complete beginners. What other book might you compare French: Short Stories for Intermediate Level to and why? I haven't read other books in French quite yet, but I have been studying on Duolingo. I like this more because I can hear and practice pronounciations a lot better than on Duolingo. Have you listened to any of Frederic Bibard and Mariem Nouni ’s other performances before? How does this one compare? No I haven't, but I definitely will now! I really enjoyed listening to this book! Not really, but I was really moved by how much I had learned and improved over the time of reading the book. I didn't know I would relearn my French skills so quickly! Love love love love love love this! 34 sur 34 personne(s) ont trouvé cet avis utile. 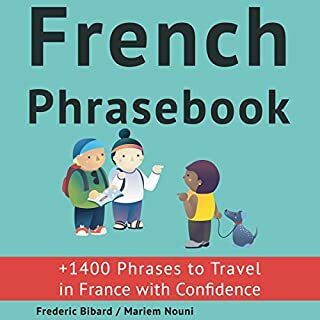 Great book for brushing up French skills! 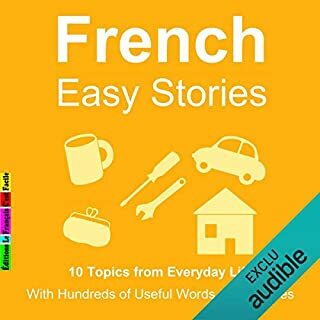 What made the experience of listening to French: Short Stories for Intermediate Level the most enjoyable? I took French in high school and college, but it's been about five years since I've had regular contact with the language. 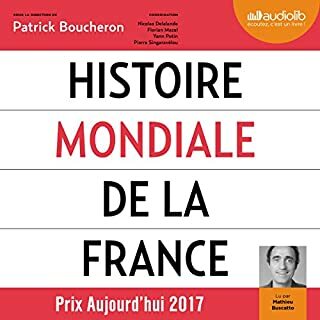 I was expecting to have difficulty really understanding anything, but for someone who has had contact with French before, this audiobook is a great refresher. I could see it being difficult to comprehend for someone who is entirely new to hearing French spoken. I didn't realize how much I missed the language until listening to this book. I can see myself returning to it, especially when I'm on my commute and have time to brush up on listening skills, even as I continue to improve. It's a good way to keep your listening skills sharp when you don't live somewhere where French is spoken often. I have two favorite parts of this audiobook. 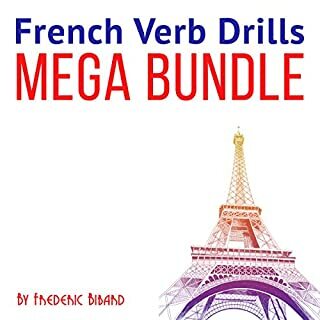 First, the fact that it is an audiobook is amazing for someone like me, who had a lot of classroom time spent learning to spell words and read French, but not a ton of time dedicated to learning how to listen and understand the language. And the fact that with the audiobook, you can choose if you want to slow down or speed up the speaker's voice, is so convenient as your skill levels change. When I started I kept it at normal speed, but when I got towards the later chapters, I increased the speaker speed to challenge myself more. This is not something you get from a print book, or even from a CD. Which character – as performed by Frederic Bibard and Mariem Nouni – was your favorite? I appreciated the use of two narrators, one female and one male, to read the stories. It makes sure that you don't get used to just one way a certain person speaks the language. Obviously with more real world experience, you'll hear different people speak the language, but I thought it was useful to have two different narrators in one audiobook to start introducing the listener to different ways the language is spoken by different individuals. I also really enjoyed Mariem Nouni's portion where she breaks down sentences and defines phrases or words in English after she reads the sentences. It helped slow me down and actually check that I was understanding things correctly. She puts an appropriate amount of pause between reading the sentence and switching to translating the sentence, so it doesn't get confusing as to what she's talking about. 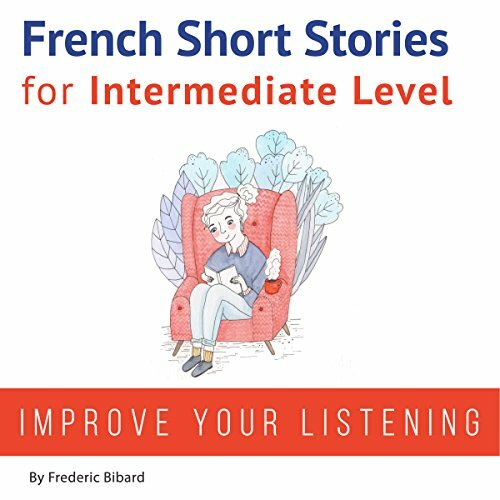 Where does French: Short Stories for Intermediate Level rank among all the audiobooks you’ve listened to so far? For me the stories are great, they really let people increase their level of french and try to improve what they've learned at the different french schools because, the narrator speak slow to let people listen to each word and pay attention to the pronunciation. Monsieur de Boite, he make me laugh and make me remember my uncle, I identfy a lot of characteristics and the narrator make me try to imagine the character. Frederic Bibard is perfect for me, his pronunciation is perfect and make me understand each word and understand the usare of the different expressions. It make me laugh but I think that is important to improve a little bit more on the characters, is important to be more expresive during the reading to make people get inside the story and imagine everything. Both narrators are really good, they let people really understand and practice listening in French that is one of the most important things to comunicate with people. 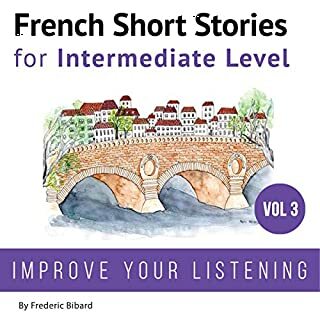 Would you consider the audio edition of French: Short Stories for Intermediate Level to be better than the print version? 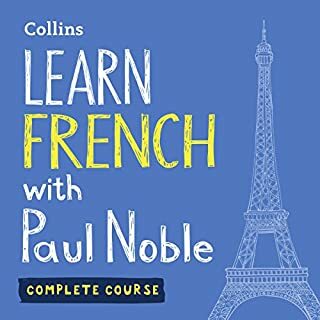 If you struggle with listening to a French accent, I highly recommend this audio edition because I found that the more I listened, the easier it was for me to understand the accent and enjoying the stories made it all the better. What does Frederic Bibard and Mariem Nouni bring to the story that you wouldn’t experience if you just read the book? The narrators speak slowly and clearly allowing for easy understanding of each story and allows for you to learn proper pronunciation. I enjoyed how I was able to listen to it on the go with the Audible app on my smartphone. I am very busy and found this feature handy. Once you get listening, its hard to stop! I have always been fascinated with the French culture, but always too shy to take a French class. This book allowed me to explore the language on my own without the fear of having to speak in front of a class like in high school. Yikes! This book improved my language proficiency and I would recommend it to anyone looking to dive in or brush up on their French. If you could sum up French: Short Stories for Intermediate Level in three words, what would they be? The final ones, because the author included vocabulary in English-French for those words and terms a little bit more complicated. it has very entertaining stories with an excellent narration that manage to get you trap in each chapter. If you are not very familiar with this accent like me, first it will be a little complicated to understand but after listening to the first stories you begin to understand a little more because of the clear and paused way the narrators have to speak. Something that I appreciate a lot is the presence of masculine and feminine voices in the narration that achieves the objective of accustoming the listener to the different tonalities of the language. For a non-native english speaker can be a little difficult to understand the instructions at first and it is because the narrator presents a strong French accent. In conclusion I can recommend this audiobook to all people who want to start tuning their ear to this language, or anyone who enjoys good stories in this fantastic language. 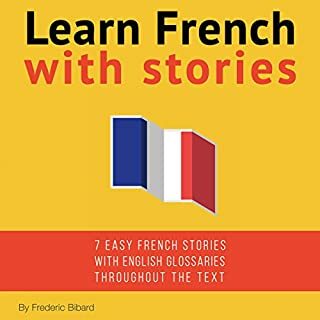 What an incredible book of short stories for studying French. I am so impressed! I studied Spanish and Italian before and dabbled a little in the French. I needed to know some of it because I used to sing in a choir that had French songs part of their repertoire. I wish I would've came across this then because that would've been such a huge help! I got the audible version first and loved it! I can clean and cook and listen to it all at the same time. It definitely refreshed my memory and even words I didn't study I was able to pick up so easily because of the storyline. My favorite part is being able to listen to it on the go which it also helps you learn pronunciation better than just reading it yourself. I even showed this to my mom, who took French when she was in High school and she really liked it. She hasn't practiced it much after, but after listening to it for a while she started remembering phrases she learned and poems. How cool is my mom? Anyways, I got to give a huge thumbs up to this book because it makes it so easy to learn French and I thought I'm going to just give up. Definitely recommend people get it. It is so worth your time and your money. Perfect aid for French pronunciation!! This book is a wonderful refresher for those who have studied French and for some reason has stopped studying like me! It is a great aid for practicing pronunciation especially because you can download the pdf file. The pdf file allows me to read along the audio book. Also the voice is so clear and it helps you say the words with the right accent which is very important in the French language. I really love that it is an audio book because I can just play it anytime, when I'm doing household chores or even out for a run or walk. This really is a must have for anybody who is learning the language! I really enjoyed this audiobook. The reader speaks very slowly and clearly so that even I, who studied French years ago, was able to follow along and recognize many words. I think this book can be very helpful for those who know some French and want to practice their comprehension of the language more. The sentences are clear so it allows you to build practice vocabulary, improve grammar, and generally just enjoy nice stories. I’d definitely recommend the book! 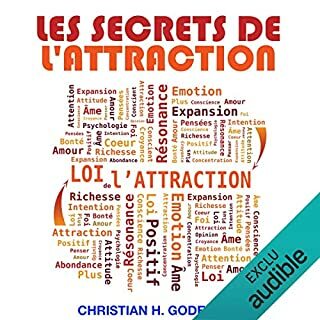 I have studied French in the past, but am by no means fluent in the language, so this audiobook has been a great addition to my French studies. It's been such a help for learning the correct pronunciation, as the audio is very easy to follow along and comprehend. It was especially helpful to have the PDF alongside the audiobook. I had no technical issues at all. Very happy to have found this audiobook and would recommend it to all! What about Frederic Bibard and Mariem Nouni ’s performance did you like? I learned new words, phrases, correct conjugation. If you are interested in learning French, this is the book for you. I'm a Romanian native speaker and I started learning French a couple of years ago. 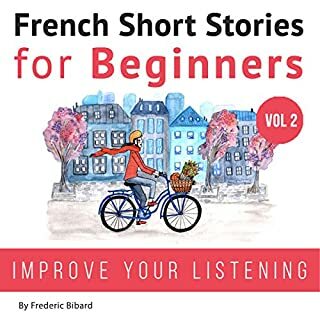 Having known the basic French phrases and grammar, I wanted to take my French knowledge to the next level so I purchased French: Short Stories for Intermediate Level through Audible. It really helped me expand my language skills. 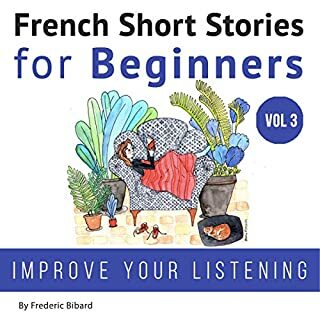 Not only the stories are narrated by a native French speaker, but they are are recorded in a slow version for beginners and a normal version for intermediate learners.